75% of consumers expect a consistent experience across all platforms, both in-person and online. This is especially difficult for small businesses who have limited time, resources and money to put towards creating a robust online presence to match their unique in-store experience. Unfortunately, small businesses that ignore the importance of establishing an online presence will be overlooked by potential customers who do a quick search on their phone and opt for the boutique or restaurant with more reviews or an established profile. Have you ever Googled your business? If not, you could be in for a rude awakening! There are lots of things that can creep up on you without you realizing they ever existed. That could be an angry customer review, a mention in a local newspaper or a fake social account masquerading at your company. Do yourself the favor, Google yourself, now. Once you’ve gotten over the shock of the results from your Google search, it’s time to be proactive! Claim all major social media profiles your customers might stumble onto when looking for your business and brand them (pictures, logos, colors) to fit your business! The primary profiles for small businesses would be Google My Business, Yelp, Facebook and Instagram. Be sure to add all your important information like phone number, email and hours of operation. When it comes to negative reviews or comments online, one of the worst things you can do is do is ignore them. In many cases, disgruntled customers just want to be heard and empathized with. If you find this sort of feedback about your business, take the time to read through it and thoughtfully respond to the customers to see if there’s a way to turn a negative experience into a positive one. 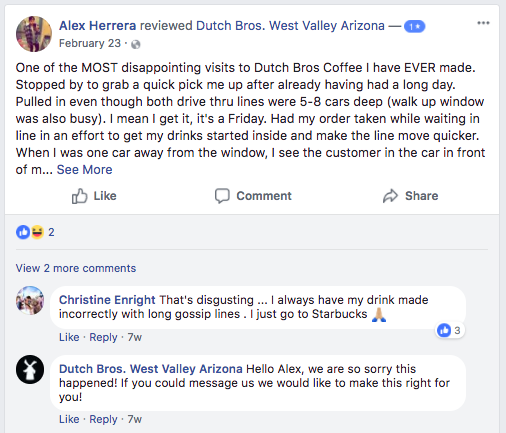 This example from Dutch Bros is an example of how to take the first step in addressing negative feedback. 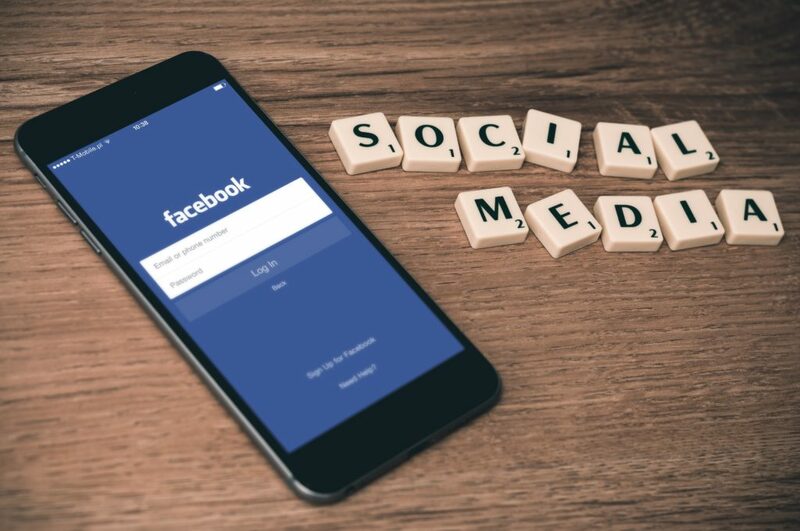 Once you’ve set up your social media accounts, it’s best to start sharing content on a consistent basis. This doesn’t mean 10 posts a day. Start small and scale the activity based on what you can manage. This is key when embarking on growing your social media presence. If this means posting one or two pictures or posts a week, do it! You can even use Facebook’s scheduling tool to help get started. Just be consistent with your activity. The foundation of social media is that it’s a two-way street. Now that your accounts are setup, you need to keep an eye on the online activity so if there are questions, negative comments or maybe even potential customers nearby, you know and can be proactive. Ampsy helps small business owners not only listen, but also engage based on custom push Alerts so you can start to build relationships online. If you make it through the last five steps, the next step is to create a simple website. There are a ton of platforms made for small businesses just getting started. Weebly, Wix and Squarespace are just a few of the options. Building a website will allow you to start building out your online presence even further, providing yet another platform for you to show off your business online! Wherever you are in the process, it’s important to make sure you complete all the steps in this starter kit for your small business social media. This way, you can start to build a consistent online presence to match the unique in-store experience your customers know and love.